The Ethical Universe: Where are we really at? | Brenda Davis R.D. The Ethical Universe: Where are we really at? This was a short speech given at NAVS Summerfest in 2003. Several people have requested copies, hence the old post. Have you ever considered what a perfectly ethical universe might look like? It would undoubtedly be a place of goodness and peace, where life is supported and cherished; where kindness and compassion are the fabric of our hearts, and love and understanding are rooted in our souls. It would be a place where evil is unknown – where violence and indifference are fictional concepts that could hardly be imagined, and where purposeful harm to living, feeling beings is unthinkable. Is a truly ethical universe an admirable sentiment but a practical impossibility? It is hardly conceivable in a world so profusely littered with hatred, greed, cruelty, and war. But each and every one of us who prays for peace, who dreams of a gentler world; who shares this vision of ethics, has a responsibility to turn thoughts into actions, to do what is within our capacity to bring us a little closer to this reality. Where are we at, as individuals and as a vegan community? How accurately does our behavior reflect the values that we have so strongly embraced? Could we do better? The sincerity, generosity and commitment of people within our movement is consistently impressive. However, like all human beings, we can easily slip into patterns of behavior that can inadvertently undermine our goals. These patterns of behavior must be recognized if they are to be overcome. The first might be called vegan supremacy. This is the attitude that vegans are morally superior to nonvegans, and are placed squarely at the center of the ethical universe. Taken to the extreme, it surmises that if you are not a vegan, you must be cruel, heartless, or morally defective. But how does one weigh and measure the ethical correctness of an individual? Does the avoidance of animal flesh weigh more heavily than countless hours volunteering at a homeless shelter, years of advocacy work attempting to abolish slave labour, or a lifetime of dedicated service preserving a failing ecosystem and all its inhabitants? Can inherent value of such acts be accurately quantified? The benefits of selfless acts spread farther and deeper than logic would dictate. Ethics has many components. If we are to be completely honest with ourselves, there are many things that vegans know to be morally correct, that our ethics demand of us, yet we do not do. That is why being self-righteous about what we actually do, and placing ourselves on a higher moral plain than others is ultimately destructive. If we form an opinion about a person based on whether or not their perspectives are allied for or against us, we condition that person for hatred, anger, bitterness and resentment. This kind of judgement serves only to make people defensive and push them away. 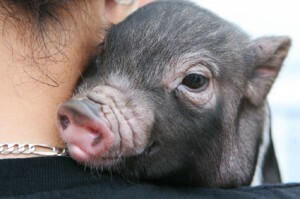 If we, as vegans are ever to succeed in moving people to expand their circles of compassion to include all living things, to completely alter their view of animals such that they could not possibility continue to consume, wear or otherwise contribute to their pain, suffering and death, we must step off of our pedestals, and connect with the people we strive to move. When we show kindness to those with whom we are at odds, we build bridges that are worth their weight in gold. We are all human beings, and the vast majority of us are trying, in our own ways, to make this world a better place. Only by acknowledging and appreciating the positive morals and ethics of each individual can we begin to rekindle the spirit of compassion that will ultimately change cultural norms. This brings to mind my friend WH. About 25 years ago, our family moved from Northern Ontario to Vancouver. Just down the street from us lived a little girl that was about my daughter’s age and they quickly became best friends. They spent every moment they could together, and we ended up spending a fair bit of time with her parents – even sharing special occasions. Her Dad, WH, was confirmed meat-eater, and our vegetarian lifestyle was a little mystifying to him, if not somewhat disturbing. As the years went by, we grew to respect and appreciate one another’s perspectives – even if we completely disagreed. About 7 years into our friendship, WH found out that his cholesterol was elevated. He starting asking a few questions – about food, and about exercise. He decided to break down and try one of our veggie burgers, and he enjoyed it more than he expected he would. He started talking to my husband about his swimming regime, and before long he was an avid distance swimmer. Soon after we were to spend a weekend on a gulf island together. To our great surprise WH told his wife that he didn’t want to bring any meat this time. I was stunned, but what really floored me was what happened after our return. He decided that if he could survive a weekend without meat, he probably didn’t need it at all. WH became a near-vegetarian. He gave up steak, chicken, pork and even turkey on thanksgiving. I am quite certain that had I judged, moralized or otherwise condemned WH’s very traditional position, he would have constructed an internal wall that would never have permitted the possibility of the choices he ultimately made. The second destructive pattern might be labelled “vegan egoism” – this is the error of over-focusing on oneself, at the expense of others, in a quest for personal perfection. In its extreme we might imagine an egocentric vegan waking up each morning, gazing into his or her magic mirror and asking the ever-pressing question: mirror, mirror on the wall, who is the most vegan of us all? For many people the quest for personal righteousness is so intense that little else seems to matter; whether it be nurturing relationships with family and friends, building positive connections with colleagues or business associates, or contributing to activities that build stronger communities. We must remember that ethics, by nature is about being becoming more other-centered and less self-centered. This is certainly not to say that we should not continue boldly on the path towards a 100% vegan lifestyle, but rather, in so doing we must insure that we do not purposefully torment or injure other people. We must recognize that our vegan lifestyle is a means to an end, not the end itself. It is so tempting to be drawn into this sort of pattern, when we are competitive by nature. I vividly recall my concern about maintaining my vegan diet while staying for a couple of days with my aunt in Windsor. I love my aunt dearly, but she had been somewhat less than supportive of my radical stance where animals are concerned. The previous year, at a family gathering in my uncles home (my parents and my aunt were also there), I was receiving more than my share taunting– everyone seemed to think I was too skinny, although in my heart I wanted to say that the only reason I looked skinny was that everyone around me was obese. They were particularly expressive while devouring their steak and lobster. For me, the final straw was the endless pressure to get me to eat just a little piece of meat…finally I couldn’t hold back any longer and just blurted out… I refuse to apologize for not partaking in the corpse of an abused animal. To me it is a barbaric custom and it is completely unjustifiable. Of course, no one was impressed, least of all, my aunt. She said that I shouldn’t say such things at the table. So, when I was to be my aunt’s house guest a year or so later, I wondered how the food situation would evolve. As it turned out, my 2 day visit was to end on 9/11 when I was to fly back home. Yes, the Sept. 11th. Needless to say, my flight was cancelled, and my stay was extended for 6 days. I was glad that during such a difficult and scary time, I was able to provide support for my aunt. I was determined to be kind to her and not to judge her or her diet. I thought that I would simply love her and support her in the best way I could. The most amazing thing happened. She decided that she wanted to eat whatever I was eating. I taught her how to make a whole grain cereal with kamut berries, oat groats and barley. She loved it. We made all kinds of ethnic dishes, and her very favorite, a marinated vegetable and tofu salad. It was quite simply wonderful. Three months later, we were talking on the phone and my aunt said, do you know that I have lost 17 pounds since you were here. And, this is the exciting part, “I have not eaten a single piece of meat”. She added I could live on vegetables and tofu. I am so glad I know how to prepare all of this great food. At that moment I was deeply grateful that I had chosen to simply love her. Finally, as a community, we have faced many challenges, some of which were painfully amplified in times of internal conflict. One might expect that when vegans are at odds, that we might come together in a spirit of mutual respect, and talk, compromise, negotiate, reconcile and deal with our differences in a caring and considerate manner. Unfortunately, we often fall short. The issue is rarely about who is right, and who is wrong, if there even is a right and wrong in such situations. Rather, it is a matter of ethics in interactions. When our energy is directed towards condemning one another, that energy gets sucked into a black hole that is riddled with bitterness, anger, resentment and hostility. This is a tragedy of significant proportions, when one considers the extraordinary potential for good that should rightly be harnessed from that energy. If we can ever hope to live in a truly ethical world – one that is guided by the principles of reverence for life, we must choose to commit to this reality in our own lives. How can we possibly expect our family, our friends, our neighbours and our leaders to adopt this philosophy in their interactions if we cannot succeed in doing so ourselves? There is one thing that we can be absolutely certain of – if an ethical world is ever to become a reality, it will be in spite of anger and aggression, in spite of cruelty and callousness, and in spite of hatred and hostility. It will become a reality because we, as individuals, have set an example of kindness and compassion, of tolerance and trust, of peace and love, that is simply too compelling to ignore. It will come because we, as a community, have stood firmly together, arm in arm, in affirmation of our commonality, and in celebration of our differences. It is only in so doing that we will establish a spiritual and personal relationship with all living beings powerful enough to crumble the cruel customs that have for centuries crippled our consciousness. I believe that this is not only a possibility, but is an eventuality that is essential to the survival of all life on this planet.